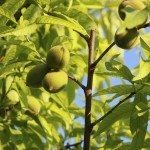 Here is a link that has more information about Peach Tree diseases. You can ask gardening questions on our Q & A page. You can upload an image on that page.